Tampa, Florida (February 12, 2019) – Modelithics® has released version 19.0 of the COMPLETE Library for Keysight Advanced Design System. Version 19.0 is compatible with the latest ADS release, ADS 2019, and adds 52 new models for passive and active components from multiple leading vendors. 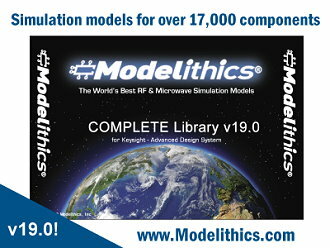 The Modelithics COMPLETE Library™ is a collection of highly accurate scalable simulation models for many passive component families and active devices. Advanced model features include substrate scaling, pad scaling and part value scaling for LCR component series, and bias-dependence and temperature effects for active devices. All models are validated with precision broadband measurements and come with a detailed model datasheet. Version 19.0 has 52 new models from 13 different vendors, representing over 940 individual components. New models include those for capacitor and inductor families from AVX, Würth Elektronik and Knowles, ten ferrite bead series from Würth Elektronik, two Southwest Microwave connectors, plus three resistor series and five attenuator families from new Modelithics Vendor Partner (MVP) International Manufacturing Services (IMS). New non-linear active device models are included for diodes from MACOM, Skyworks and Toshiba, transformers from Premier Magnetics, and transistors from CEL and Infineon. Substrate selectable S-parameter models have also been added for Mini-Circuits splitter/combiner components. Many of the new models are measurement validated to 30 or 40 GHz and are also included in the Modelithics mmWave & 5G Library™. Model-to-measurement validations can be reviewed on each model datasheet, which can be accessed from the Modelithics website, www.Modelithics.com. For more information about this new release or to request a free trial, please visit the website, or contact us at sales@modelithics.com.